I’m really excited to announce that my new lucid dreaming training course is available for download. It’s called the Lucid Immersion Blueprint. This is the distillation of contemporary dream research, ancient dream practices and my own personal experience into a step-by-step plan for going deeper into lucid dreaming. In a nutshell, this is the home study course I wish I had twenty years ago when I got started with lucid dreaming. It would have saved me a lot of frustration, confusion, and nightmares too. The Immersion method is about playing smart, not working hard. This is the dream induction method I use to regularly double my usual lucid dreaming rate. But more than that, it’s a holistic life practice that soaks into your bones, encouraging lucidity not just in your dreams, but also in your waking life. As you probably know as a reader of DreamStudies, I believe lucid dreaming comes naturally as a fruit of lucid living. 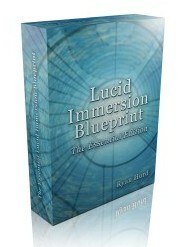 The Lucid Immersion Blueprint shows you the nuts and bolts of how to set up a more lucid life in a sustainable way. To learn more about my new digital course, here’s the link to the information page. And if you’d like to help me spread the word, check out my affiliate program here. There’s just… so much in it… I mean…. WOW. This will keep my nights occupied for a good, long while. And at a special price! And I can finally kick my Stephen LeBerge book to the curb! Many thanks, Ryan. I will direct any of my friends who show the least bit interest in lucid dreaming to your veritable tome. thanks! yes, it is a lot of information! but the hope of the project is to cut down on the overwhelm by building a plan that works…. don’t kick LaBerge’s book away tho…. it’s still foundational in my opinion when it comes to building intentions and prospective memory development. I feel that this work rests upon Stephen’s shoulders. Ha, well, there’s nothing wrong with LaBerge’s material. It’s just always good to start off fresh, ya know? Besides, my copy is half shredded from all the exercises I tore out so I’d have them close at hand when I would try for a MILD or WILD. Ye stand on the shoulder of giants and do it well, Ryan. I just got the advanced addition and can’t wait to dig in! Thanks for putting this together! thanks for supporting my work, Danny! keep in touch about how the material treats you. Can’t wait to put your immersion method into practice, looking forward to many meaningful lucid dreams and real lucid living. I think what you’ve done with this blueprint is nothing short of incredible!